As Dinosaurs dominated life on Earth during the latter part of the Mesozoic they diversified into many varied forms, each genus adapting to a specific way of life and filling an ecological niche. Further research has just been published (November 2007) on a particularly bizarre looking sauropod from Africa – Nigersaurus. Nigersaurus was first described in 1976 but little was known about this Diplodocoid sauropod as although many isolated bones and fragments of fossils had been recovered very few were found in any form of association or articulation, so piecing together a complete picture of this animal was proving difficult. Nigersaurus (means “Niger lizard”) has been found in the fossil rich sediments of the Elrhaz Formation in the Niger Republic – Africa. A rich variety of fauna has been recovered from this particular fossil site including fossils of the Iguanodont Ouranosaurus and the huge, ancient crocodile Sarcosuchus, however because of the nature of the bones of Nigersaurus (highly pneumatic – filled with air spaces) and the delicate structure of the skull the remains of Nigersaurus were often overlooked in favour of better preserved and articulated specimens. Now research published in the scientific journal “The Public Library of Science” building on work carried out by the American palaeontologist, Paul Sereno (University of Chicago) and his colleagues has shed new light on this remarkable animal. Nigersaurus lived during the early/middle Cretaceous, fossil evidence suggests that these type of animals were around from 119 to approximately 99 million years ago (Aptian and Albian faunal stages). It was a member of the Rebbachisaur family, a group of Sauropods from the southern continents and Europe. 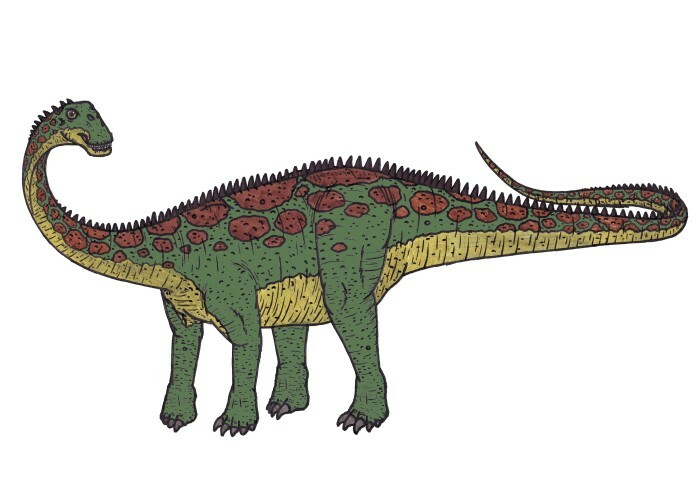 Estimates of size vary but it is believed that Nigersaurus grew to lengths of around 10 metres and when compared to more typical Diplodocoids its neck was considerably shorter. The most remarkable feature of the Rebbachisaurs, and very evident in Nigersaurus was the extensive battery of sophisticated teeth. Nigersaurus had upwards of 600 teeth in its jaws. These teeth were arranged in rows along the front edges of the jaws, forming effective 30 cm long shears for cropping vegetation. Study of the head and neck vertebrae indicate that the head was held close to the ground and Nigersaurus was probably a low level browser, shearing away at ferns, horsetails and other ground level plants like a cow grazing.